← You Think I’m Psycho, Don’t You Mama? Up until a decade or two ago, Harvard Square was the kind of place where you could browse through record stores like Strawberries, and maybe pick up the latest Rolling Stone, Circus or Creem magazine at Out of Town News or Nini's Corner (where the resident tabby cat would perch on the stacks of magazines or the front counter). There were a plethora of unique options where you could chose to grab a bite afterwards at The Tasty's sandwich counter, perhaps some potato skins and a beer at The Wursthaus, or coffee and dessert at Mug and Muffin or The Greenhouse. Sadly, since the development of Harvard Square as a sprawling outdoor mall replete with chain restaurants and clothing stores, those days are gone, with nothing left but a tear in the eye of faux John Harvard's bronze cheek. 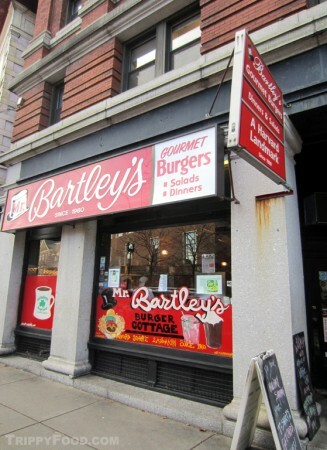 There are a mere handful of survivors of the modernization of Harvard Square, with one of the most notable being Mr. Bartley's Gourmet Burgers. Bartley's has stood watch across from Harvard's historic brick-walled yard at end of the square on Mass Avenue since the Kennedy Administration - locals knew it as Bartley's Burger Cottage, but it seems that in order to prosper in this era of elite foodism, they have graduated to gourmet status. 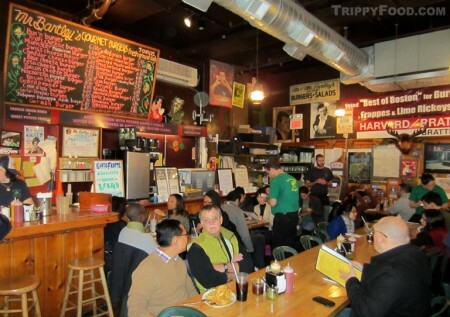 If the truth be told (and it had better when you reside across from the oldest university in America whose Latin motto translates to "Truth"), the only things gourmet about the burger joint are its name, the burgers and the prices. The decor is Boston kitsch - the place looks like the Beantown version of a Delta Tau Chi dorm room, complete with a painted Ted Kennedy caricature, several busts of Elvis, the obligatory "Irish Need Not Apply" sign and the sign from the Red Line's Harvard T station. Unless you're lucky to get one of the smaller tables on either side of the space, it's communal dining on plastic lawn chairs or bellying up to the bar (although in warmer months there's outdoor sidewalk dining available). Bartley's burgers aren't cheap - a barebones 7-ounce patty on a bun will set you back around six bucks (cash only) and will arrive at the table accompanied only by a handful of potato chips and a pickle unless you care to spring for a more substantial side. Those willing to drop a little more cash can order off of Bartley's menu of celebrity-named concoctions such as The Jeremy Linsanity (a "pizza burger" topped with marinara sauce and mozzarella cheese), The Guy Fieri (an oddly simple Muenster cheeseburger with sliced tomato and red onion, lettuce, and Russian dressing), or The Elizabeth Warren (a Swiss cheeseburger with grilled peppers) - most come with French fries, onion rings or potato salad. These namesakes will set you back between 10 and 20 dollars depending on how crazy you want to get; naturally I chose to get certifiable loony and selected The Chef Todd Fisher, an ample, coronary-contributing plate with a hot, juicy beef patty smothered in grilled onions and cole slaw and featuring a fried egg draped across the top. For amplification, this mélange is liberally drizzled with hot sauce and served with a cup of Cajun salsa. The whole shooting match is capped with a sesame-seed bun perched precariously on top and flanked by a mound of golden onion rings. 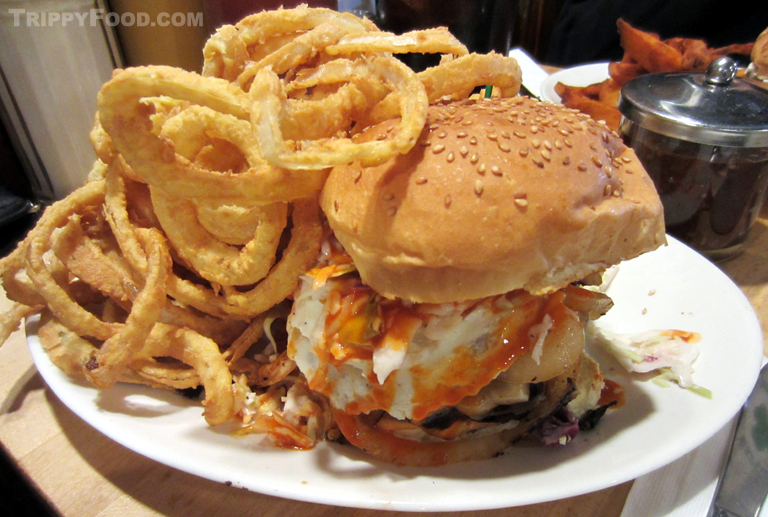 This entry was posted in New England and tagged Boston, burger, Burger Cottage, Cambridge, Gourmet Burgers, Guy Fieri, hamburger, Harvard Square, MA, Mass, Massachusetts, Mr. Bartley's. Bookmark the permalink.